OOH, YEAH~ HO HO~ Hi, dear people! I'm here with SOMETHING NEAT in hand. This is very much the finest flying island home of seen that matches my character on-point! in such a perfect design presentation of Pommelia Island (though it was Pommelya, thus I suppose it DOES roll better). Prince Rikki (and mother Queen Kiki) lives.Pretty groovy for a tree castle. Has astral-jewel decor within. Said forest mentioned is quite thick on jungle elements, though it's a serene area. In Mount. Moik Ouu is where we keep past history, and once was a active volcano AND the first Palace. Origin crystals to our tribe bearing on all foreheads started there, too. 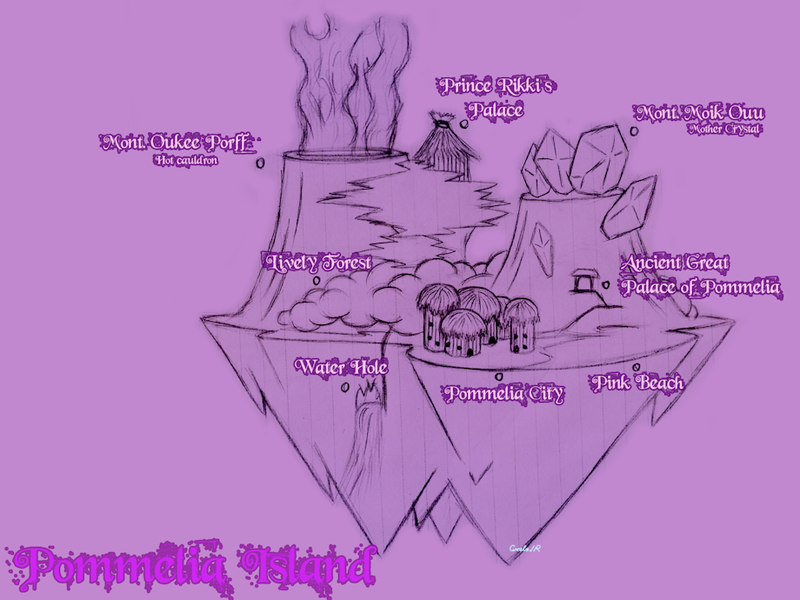 Pommelia City and Pink Beach are places the Royal Family and villagefolk gather to help each other, importantly. Chilling out, business, fun, gatherings of tribe meetings, dances, etc. Non-saltwater pours out there when landmass is airborne. Ideal place for cleansing body and mind.